Alan Stubbs is determined no expense will be spared to ensure his Easter Road squad are in peak condition for what he hopes will be a memorable finale to the season. Hibs have endured a gruelling schedule of matches, reaching the finals of both the League and Scottish Cups while battling to achieve their top target of promotion. Tomorrow’s trip to face Morton and Tuesday night’s home match against Dumbarton will take the total of games played this month to eight with Hibs potentially facing a similar number of fixtures next month depending on where they finish in the Championship. 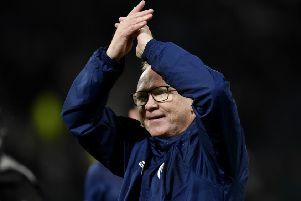 Wednesday night’s win over champions Rangers renewed hopes that Hibs might pip Falkirk to second place so reducing the potential number of play-off games by two while offering the players a ten-day respite between their final league match, at home to Queen of the South a week on Sunday, before beginning their final push for promotion. And although he believes his players have become “immune” to an unrelenting programme of midweek matches, Stubbs is aiming to do all he can to help them cope with the final straight, including that Scottish Cup final against Rangers. The head coach said: “We have been playing constantly. We had a heavy schedule in March and now April and it’s going to be the same in May. I think the players are starting to get immune to it and that’s helped, their bodies have adjusted. “But we are trying everything possible to enhance the recovery process between games. We’re going to introduce some new things covering nutrition, drinks, vitamins and other aspects of recovery, we are looking at every possible aspect. Stubbs who believes performances are “starting to get to where they have to be again”, will also be bolstered by the imminent return to action of Liam Fontaine [thigh], Dylan McGeouch [groin] and Dan Carmichael [groin] while he’s hopeful, depending on the results of a scan on his hamstring injury, that Farid El Alagui will also have a part to play. He said: “Liam, Dylan and Dan are getting closer. Hopefully, Liam and possibly Dan will be back training next week and Dylan the following week. We seem to be making good progress on the injuries front.